Town’s stand out performer Pelly-Ruddock Mpanzu was thrilled to take his chance with both hands when recalled to the side on Easter Monday. 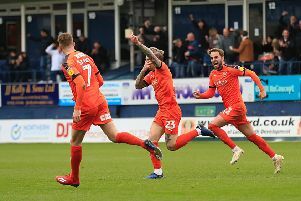 With Luke Berry suffering a serious injury against Colchester on Good Friday, Luton boss Nathan Jones opted to bring back Mpanzu for his first league start in over three months. The main thing is to get three points, but to get man of the match is a personal good point for myself. The 24-year-old repaid him in full though, producing a wonderful display as he proved the main difference in the second period as Luton hit back to win 2-1. Mpanzu said: “It’s good to be back, it’s been a while since I last had a game, so it was good I put in a good performance and we came out 2-1 winners. After so long out of the side, Mpanzu playing just 65 minutes in the league since the FA Cup defeat to Newcastle in January, the midfielder made sure he grew into the game, not trying anything too outlandish early on. It was a definite ploy that paid off, with the former West Ham player saying: “Once you’re playing in the wide areas, you want to get the ball, keep it moving and don’t want to do too much too early. “Thankfully I did that and I just had to express myself. Mpanzu did just that too as with Luton trailing 1-0, he picked up possession, drove at the visiting defence and sent over the perfect cross for James Collins to make it 1-1. He said: “That’s part of my game, the gaffer says in the final third, make sure you make something happen, so I did that and Collo was there to pounce and make it 1-1. The home fans were clearly impressed by what they saw too, with Mpanzu named man of the match and his name chanted during the second half too. Although modest, he was clearly buoyed to hear such an ovation, saying: “It was good, the main thing is to get three points, but to get man of the match is a personal good point for myself. Despite not being in the side for such a lengthy period, Mpanzu never let himself get too down by his lack of first team action. He said: “That’s football, there’s highs and lows, you’ve got to take it with a pinch of salt. “You’ve got to keep going, can’t be negative, you’ve got to keep training hard and grab your moment when you can and I did. “Thankfully I was back in the starting line-up and contributed to the team. “It’s good to get out, good to get a game, good to get 90 minutes, obviously the big thing was for us to get three points and we did that. “Everyone’s got to stick together, it’s a long season, we’ve got five games to go. Mpanzu clearly impressed his team-mates too, with a number going over to him at the final whistle, as match-winner Glen Rea added: “Everyone knows what he can bring to the team and he did it.